We saw the Gotham pilot last night at Comic-Con, along with a couple thousand other people. It was not as bad as we feared nor as good as we hoped. 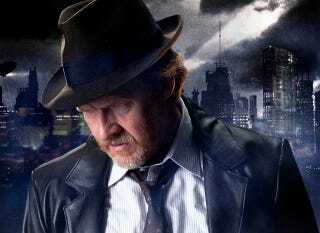 But Donal Logue flat-out killed the role of Harvey Bullock. He's so good, you'll wish Jim Gordon wasn't the main character. Donal Logue: This is going to get said a lot in the run-up to Gotham's premiere but: Logue's Bullock is great. A lot of the actors in the show are clearly settling into their characters, which is fine — it is just the pilot. Some people are a little flat and others have gone full camp. Not Logue. In the very stylized world Gotham inhabits (it's a cool, if sometimes jarring mix of retro and modern), Bullock is the only one who feels like a real, three-dimensional person instead of a character. You feel his history with the city and its inhabitants. You know he's not a perfect cop, but you also feel that he's a good guy. And he's funny, in a wry, beaten-down way. Jada Pinkett-Smith: Okay, hear me out. She's like the mirror-verse version of Logue. If everyone in this show falls somewhere between "ridiculous caricature" and "three-dimensional character," she and Logue would be the two anchors of that spectrum. She's utterly absurd. But she is having the time of her life as Fish Mooney, and it's really entertaining. There's a scene where she auditions a comedian telling awful jokes that is a wonder, just because of how many outlandish and over-the-top turns her character takes. Not a Single Character Is Wasted: Save for Fish Mooney, not a single character we spend time with isn't a version of an already famous DC character. Selina Kyle doesn't have much to do in the pilot, but she flits around on the edges. The captain is Sarah Essen, Edward Nygma shows up as a forensic scientist (he's also a standout, although mostly comic relief), Oswald Cobblepot turns informant to Renee Montoya and Crispus Allen. Even a visit to a petty criminal leads us to young Poison Ivy. It's like a fanfic AU, set in a police station. Law and Order: Gotham City. Great Style: The retro-noir feel makes you excuse the fact that people stand in shadows having loaded conversations about the seedy underbelly of the world. That's how film noir works, so you accept the pastiche. Plus, it looks great to have people in these clothes, cars, and sets. The little touches that aren't period, like Fish Mooney's red bangs, give it a style all its own. However, the old cars do clash badly with the cell phones. I'm betting they get the mix right in the end, though, because it's largely great. Especially the police station, which is dark and made of wood and not the office building or high-tech super-Apple store we're used to seeing on TV. Jim Gordon: It's hard being a paragon of virtue in Gotham City. It really is. It's also, unfortunately, boring. Part of his journey is going to have to be quickly gaining some semblance of common sense, because his utter commitment to the law and doing things by the book means he often does things that make him look like an idiot. He's like Carrot when he first shows up in Discworld's Guards! Guards!, only he's not meant to be funny. Plus, he has the misfortune of spending a lot of the episode with Bullock, who isn't a caricature. But we think Ben McKenzie's up to the challenge. Alfred Pennyworth: Oh god, kill this characterization with fire. He's described by the show as a "A tough-as-nails ex-marine from East London." And when he yelled at Bruce Wayne to "Get his bloody arse down here," I wanted to put my fist through the screen. It's one of only two scenes he has in the pilot AND IT'S SO BAD. Save Alfred (WHY? ), the Gotham pilot was a serviceable introduction to the new world. There's a lot to set up, and they did it admirably. Come for the tasty Batman continuity shout-outs, stay for Donal Logue.